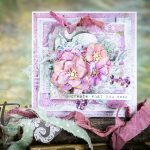 Topiary Treasures die set to show you just how awesome using all three of these techniques can be! 1. Begin by inking white cardstock with twisted citron colored ink. Blend it to cover the cardstock fully. Cut and emboss the three rounded topiary pieces from the inked cardstock. 2. Leaving the die in place, apply mowed lawn ink over the die, stenciling the darker color tone onto the embossed areas. 3. Using a blending tool to apply and your finger to blend, add shadow to the cut and embossed pieces by applying bundled sage to a portion of each topiary piece. 4. Cut and emboss the pot from gold cardstock and the center stick from kraft cardstock. Assemble the topiary on a white panel, adhering parts with foam tape for dimension. Be sure to position the shadowed parts correctly. 5. Stamp sentiment in brown ink and adhere sequins. Adhere panel to a kraft card base. 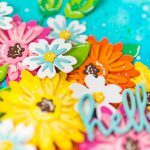 Isn’t it just amazing how awesome it looks when you cut, emboss, and stencil with a Spellbinders die? I love it! 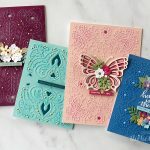 I can’t wait to see how you use the full versatility of your Spellbinders products!